Look around you. The true leaders in your organization are the people who share a particular skill: the ability to communicate effectively. Coincidence? Hardly. Experts now agree that the movers and shakers who climb the corporate ladder fastest are the ones who can relate easily to everyone … present their ideas with conviction (and charisma!) … and emerge from almost every personal interaction on a high note. They realize diplomacy works far better than brute force. They know how to help people "get it" the first time. They can empathize, and they know how to get the support they need. They don't waste time rehashing instructions or entering into arguments that go nowhere. They listen first and act second — not the other way around. After two days of coaching, practice and critiquing, you'll emerge a far more powerful communicator. 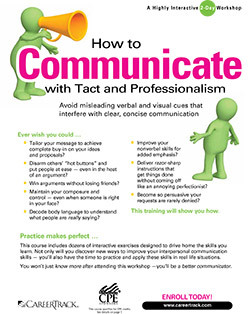 We'll demonstrate and drive home the essential skills you need to become a more polished, persuasive communicator. You'll gain insights into everything from making a good impression … to motivating people … to intervening in tense situations. After two days packed with one great idea after another, you'll leave amazed at your new communication skills — and eager to apply everything you've learned.